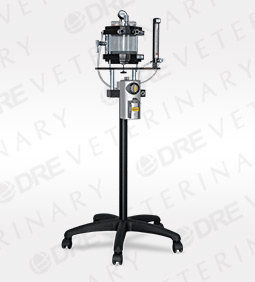 The right choice for veterinarians who need a reliable anesthesia machine with a small footprint. 0.1 to 4 oxygen flow meter with rotary float. SELECTATEC™ compatibility manifold for easy and quick installation of vaporizer. Patient circuit with 2 and 3-liter bags. New momentary closed feature incorporated into the pop-off valve. 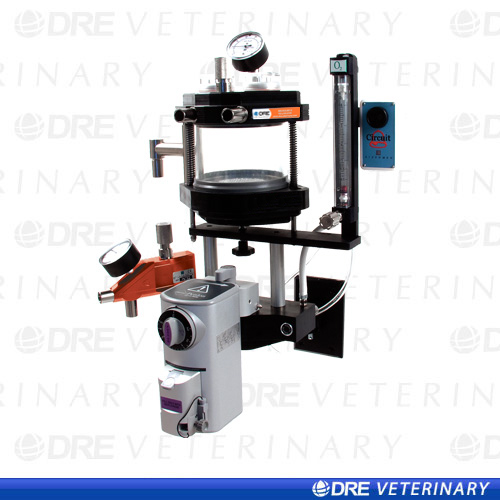 Optional Deeper Canister Base: This Deeper Canister Base option is exclusively available through DRE Veterinary. 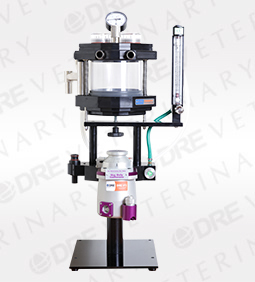 The Deeper Canister Base is designed for facilities that are performing procedures on patients with larger amounts of condensation. This is a common problem in many University and Research facilities.? Works great for those performing pig/swine research. The deeper base is designed to trap the condensation build up. Underneath the base is a drain which prevents one from having to empty out the carbolime canister over and over. Watch our video on the assembly and use of the DRE Premier XP! Length: 68.58 cm | 27"
Width: 66.04 cm | 26"
Height: 45.72 cm | 18"
Weight: 19.54 kg | 43 lbs.